NIA CHARLESTOWN NEVIS (November 14, 2018) — The first ambassador to represent the Republic of Romania in St. Kitts and Nevis Her Excellency Gentiana Serbu said her visit to St. Kitts and Nevis as a visitor and ambassador is helpful and will enable her to send the right message to her homeland. The ambassador made the comment when she paid a courtesy call on Hon. Mark Brantley, St. Kitts and Nevis’ Minister of Foreign Affairs and Aviation and Premier of Nevis, at his Pinney’s Estate office on November 13, 2018, one day after presenting her credentials to His Excellency Sir Tapley Seaton, Governor General of St. Kitts and Nevis in Basseterre. “For me it’s very important to see the reality on the front and to send the right message back home and this was very helpful for Romania,” she said. Romania is set to take on the presidency of the European Union (EU) shortly and is also a candidate for the Non-permanent seat on the Security Council. 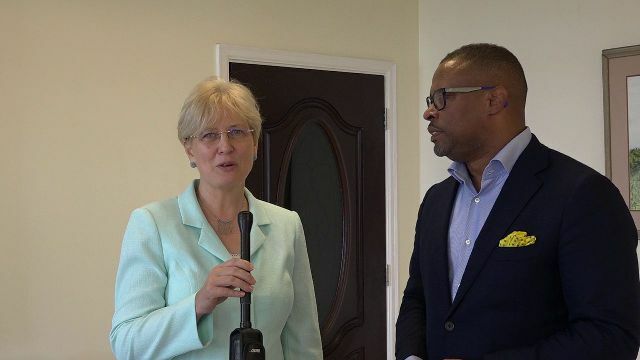 The ambassador said it for those reasons it is important that Romania has a clear understanding of the challenges faced by small island states like St. Kitts and Nevis. Ambassador Serbu who is visiting the Federation from November 10 to 15, stated that her country made changes to its policies following an assessment and began to advocate for a graduated approach to blacklisting within the EU, an issue which has directly impacted Small Island Developing States (SIDS) including St. Kitts and Nevis. She also spoke on the areas in which Romania and the Federation could develop their relationship. “I think we can develop not only on multilateral level that we have started already but also on bilateral and I am happy that Romania could contribute with a small amount of money, but it’s our contribution to the recovering of the water system in St. Kitts and Nevis. “So if we can support, we have possibilities we explored and I talked with different ministries that I met about this…I presented offers on education, on health, on administrative for building and all the possibilities we have in front of us. Also, I talked to the Chamber of Industry and Commerce about the possibility for investors about cooperation,” the ambassador said. Meantime, as Mr. Brantley welcomed the new ambassador, he noted that the Federation has been trying to develop good relations with the government and people of Romania, and looks forward to continuing the partnership. The minister expressed satisfaction with Romania for its decision to appoint an ambassador to St. Kitts and Nevis. “We hope that this is a continuation of the really good relations that we’ve established, as we continue to try and deepen our relationship that we currently have. “We are particularly pleased that Romania will take on the presidency of the EU very shortly. That’s a very important position, and as we look to our own post Brexit relationship with the EU, we look to issues such as blacklisting, the [Organisation for Economic Co-operation and Development] OECD and other issues, we think that Romania can certainly be a good friend for us, to be a voice for us in those forums in which we do not have a voice,” he said.